Dante was fascinated by the multiplicity of languages and liked playing with languages and dialects. This is probably why we find in the Divine Comedy two examples of his invented languages – the language of Pluto (pape satàn pape satàn aleppe) and the one of Nimrod, the king of Babel who decided to build the famous tower against divine will. 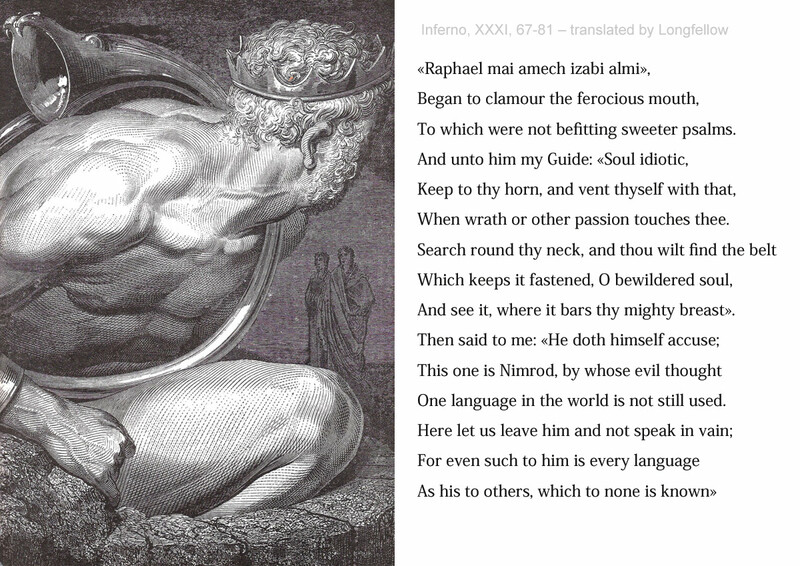 When Nimrod saw Dante appearing in his infernal circle, he attacked him with an angry, threatening and definitely incomprehensible invective: «raphèl maì amecche zabì almi!». We can quite understand why Nimrod was in such a bad mood. The plate of Gustave Doré represents king Nimrod of Babel who decided to build the famous tower against divine will. There he was, in the very last circle of Hell, suffering the undying wrath of the Almighty, and for what? For that blessed tower! And, as if that wasn’t enough, everybody now blamed him, saying he was the one who caused the confusion of languages. Well, here at Dantepoliglotta we want to strike a blow for Nimrod, because the confusion of languages – even admitting that he caused it – is some disadvantage, but also a great cultural wealth. Each language has its own musicality, its own artistic potential, its own literary production. And every literary production, large or small, is potentially capable of multiplying into the huge number of existing languages. With the Divine Comedy this multiplication reaches amazing dimensions. The site Dantepoliglotta presents a wealth of about two hundred editions of translations of the Divine Comedy in sixty different languages and dialects. It has the express purpose of paying tribute to the universality of Dante by making this rich multicultural heritage known to the public via the internet for the pleasure of those who love the Divine Comedy, for the joy of those who adore languages and dialects, and for the consolation of King Nimrod of Babel. * Dantepoliglotta was created in October 2012 and is a work in progress. The editions of Dante will be presented on the site by inserting the frontispiece and one or more pages of each text. For the illustrated editions one or more plates will also be inserted. Furthermore, a number of short essays and scraps of news will be added here and there to give information on interesting and curious issues dealing with history, mythology, linguistics, arts and letters. For the moment we will start – ça va sans dire – from the cantica of Hell. In order to see the front page of the first printed edition of the Divine Comedy (Johan Numeister, Foligno, 1472) with the first tercets of the Hell (Verses 1-21) click here. In order to see the front page and the first tercets of the Hell (verses 1-21) in the Venetian edition of 1564 (Giovambattista, Marchiò Sessa e fratelli) click here. In order to see the first tercets of the Hell (verses 1-21) in the critical edition of Enciclopedia Dantesca (1978) click here. The websites that offer the entire original text of the Divine Comedy online are quite numerous. Dantepoliglotta reports its visitors the site http://divinacommedia.weebly.com/, which provides extensive comments as well, for every single canto. We also report the sites http://www.worldofdante.org/ and http://digitaldante.columbia.edu/, two multi-media research tools in English intended to facilitate the study of the Divine Comedy.